You might have heard that email marketing is dead, and you’d be CRAZY to believe it. Email marketing is, hands-down, one of the best ways to leverage the web to grow your business. However, you’ve got to know what to do and how to do it. Because while good email marketing is alive and kicking, bad email marketing leaves companies rotting by the wayside with loads of unhappy readers and customers. What’s the difference between good and bad email marketing? That’s where this educational series from DIYthemes comes into play. We’ll hold you by the hand, and show you exactly what you need to know about email marketing. 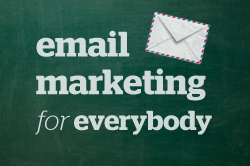 So you want to use email marketing in your business? Look no further. Let’s cut the fluff, and jump right in. And then, after you optimize your about page, you’ll need some opt-in forms. If you plan on using email marketing to grow your business, you’ll need opt-in forms, high-converting forms where people can give you their email in exchange for signing up to your newsletter. However, by now you know how much I love the Feature Box for email conversions. Last year, I went on a mission to tell everyone how great it is (because it is), and now everyone is using one. Don’t miss out. Once you’ve got your website whipped into shape, you’ve got to build an email list. You have the opt-in forms ready to go, but what else can you do?